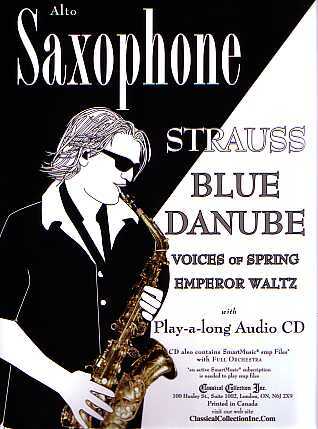 Three Strauss Waltzes: Blue Danube (Op. 314), Voices of Spring (Op. 410), and Emperor Waltz (Op. 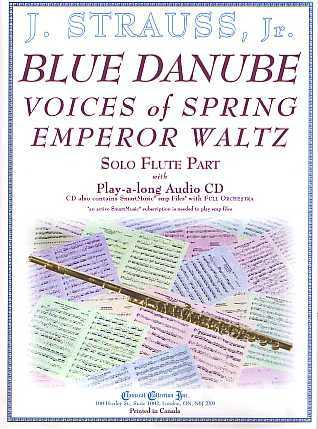 437), are presented as a Solo for Flute, Clarinet or Alto Saxophone with a play-a-long Audio CD which also contains SmartMusic SMP Files. This edition of Three Strauss Waltzes is ideal for anyone who is studying or listening, to better understand and, in general, enjoy the wonderful music of these outstanding pieces! Johann Strauss, Junior, violinist, conductor and composer, was born in Vienna, Austria on October 25, 1829 and died in Vienna on June 3, 1899. He was from a musical family with his father, Johann, Sr. (1804-1849) and two younger brothers, Joseph (1827-1870) and Eduard (1835-1916), all also being violinists, conductors and composers. Johann, senior, first came to prominence in 1829 with his compositions Täuberlin-Waltzer (Op. 1) and Döblinger Reunion-Waltzer (Op. 2). His orchestra was heard in Vienna by celebrities of the time including composers Frédéric Chopin (1810-1849), Richard Wagner (1813-1883) and author Hans Christian Andersen (1805-1875) and toured Europe - in England, even performing at Queen Victoria’s coronation celebration in 1839. Johann Strauss, junior, wrote his first waltz at age 6; started his own orchestra (at age 14) in 1844, which competed with his father’s orchestra until the two were combined in 1849, at his father’s death. Like his father he toured: Europe, including England and Russia (conducting the first performance of Tchaikovsky’s (1840-1893) Characteristic Dances in 1865; and the United States (Boston and New York in 1871-2). He composed a large number of instrumental works - Polkas, Marches and Quadrilles (a dance performed by four couples - a precursor to the modern Square Dance) and also works for the stage, mainly 3 act operettas including Die Fledermaus (The Bat, 1874) and Der Zigeunerbaron (The Gypsy Baron, 1885). But he most famous for his waltzes - he wrote more than 150. The Waltz structure (“Set”), perfected by Johann, senior and Joseph Lanner (1801-1845), usually consisted of a slow Introduction, 5 Waltzes and a Coda (reprising several of the waltzes and bringing the work to an end). The Beautiful Blue Danube (An der schönen, blauen Donua, Op. 314), composed in 1867, follows this structure. Each of the 5 waltzes has a segno (sign) at the beginning (bar 1 of each waltz) and a D. S. (Dal Segno - to the sign) at its end; no repeats are played during the D. S. - 2nd endings are used or 3rd ending (Fine - leading to the next waltz, transition to the next waltz or Coda). 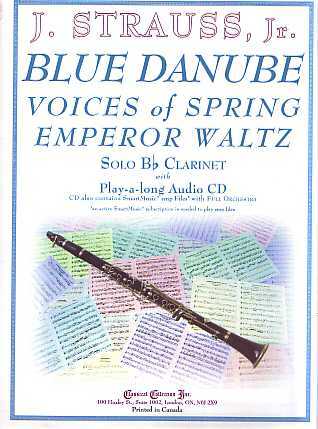 The Blue Danube is 424 (notated) measures in length but in an actual performance of the complete work a total of 724 measures is played - 300 bars would need to be added if this repeat system were not used! Voices Of Spring (Fruhlingsstimmen, Op. 410), composed in 1883, begins at waltz tempo (no slow Introduction) and has only 3 waltzes (none using a D. S.) and Coda - but is still 342 measures in length. The Emperor Waltz (Kaiser-Waltzer, Op. 437), composed in 1889, begins with a slow Introduction (a March), has 4 waltzes (only No. 4 uses a D. S.) and Coda. There are several Tempo changes - Waltz No. 1 begins at a slower speed before reaching full waltz tempo both in its first statement and in the Coda; also there is a pause in the Coda, 27 measures from the end. In this arrangement, to make for “more friendly” key signatures, Blue Danube has been transposed up a semi tone. Both Voices Of Spring and Emperor Waltz are in their original keys.